Lifetime's UnREAL is back for a third season to prove who's boss and hoping to redeem itself for a muddled and disappointing sophomore season. 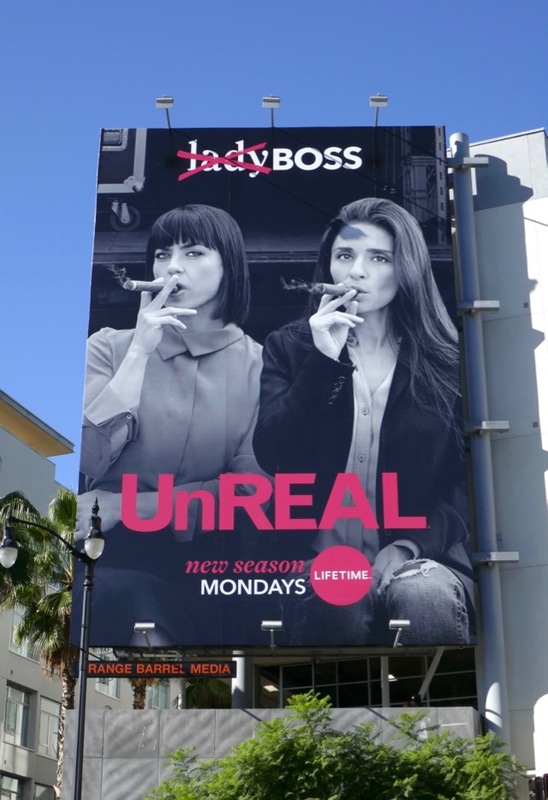 This season it's back to basics for Constance Zimmer's executive producer 'Quinn' and show producer Shiri Appleby's 'Rachel' as they manipulate their reality dating show 'Everlasting' behind-the-scenes for maximum drama and ratings. In this outing it's tech mogul 'Serena' (Caitlin Fitzgerald) who's trying to find true love amongst a plethora of male suitors, but will they be attracted to a woman who's more successful than them. 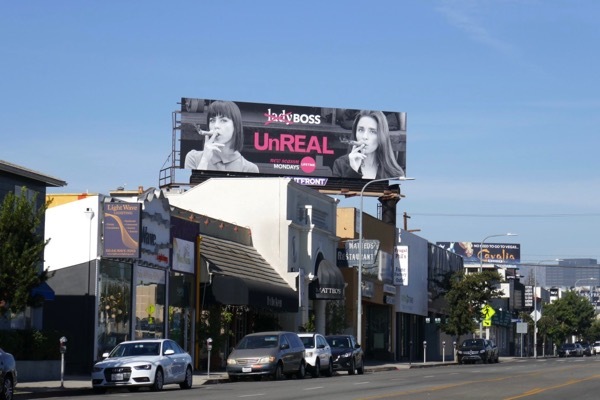 These season three billboards for UnREAL were snapped along Westwood Boulevard, Vine Street and San Vicente Boulevard from February 4 to February 8, 2018. 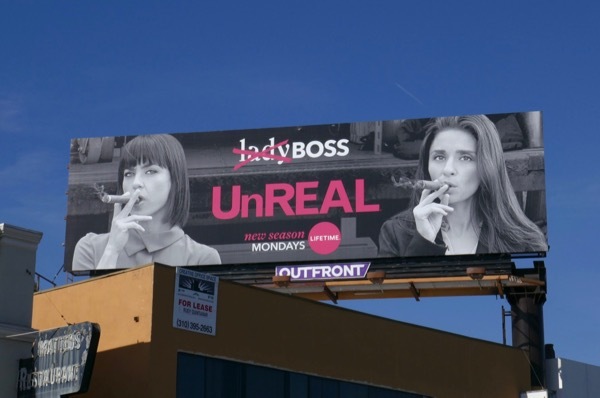 Fans of the show can also enjoy all these previous season promo and awards consideration billboards for UnREAL. 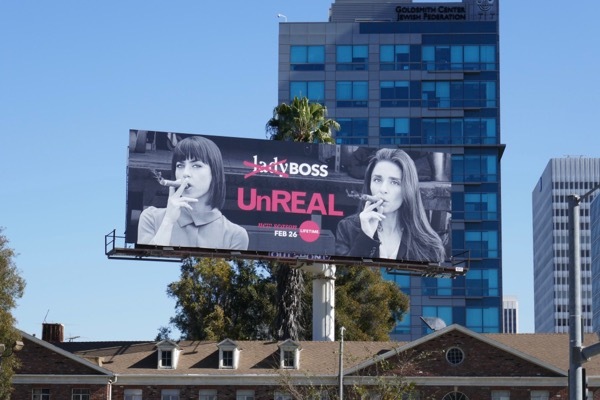 It's sad that some people equate smoking cigars with being successful because of their expensive cost, they can still cause throat and lung cancer, but here a few other examples where they've been used in ads, including these billboards for The Boss movie and this Amy Schumer Live at the Apollo billboard. 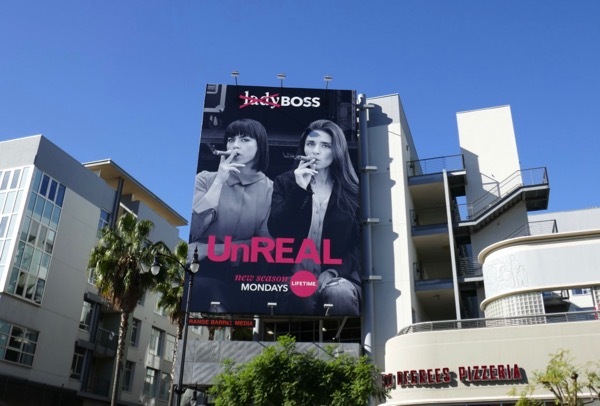 Can the Emmy-nominated series recapture the magic of the critically-acclaimed first season and go on to run as long as shows like The Bachelor (now in its twenty-second season), or will its rose wither and die and be sent home.